Decathlon (technically, the Decathlon Group) is a world-wide chain of sporting-goods stores. It is, in fact, the largest sporting goods retailer in the world. It was founded in France in 1976. In the mid-1980s it started to expand into other European countries. In 2003 it started to expand into China, India, and Southeast Asia. Today, it has more than 1,100 stores (many of which are large superstores that stock a wide range of sporting goods) in 38 countries. There are about 40 stores in the UK, and one in Mexico. For petanque players, the interesting thing about Decathlon stores is that they stock petanque boules and other petanque equipment. Decathlon has multiple research and development facilities in France dedicated to developing new designs for sporting equipment, and, since 1986, it designs and manufactures its own lines of sporting goods. There are now over 20 “Passion” brands, each dedicated to a single sport (or to one type of sport) for 70 different sports. The “Passion Geologic” brand, or simply Geologic, was created in 2008. It is dedicated to “target sports” such as darts, archery, pool, and petanque. Early in 2018, Decathlon opened its first store in the United States, in San Francisco, California. The business plan is to open stores in other states in the USA, and then (in a year or two?) to expand into Canada. Their website says that their goal is to make every Decathlon product available throughout the USA. The San Francisco Decathlon store is located at 735 Market Street, San Francisco 94103 (between 3rd and 4th)— close to the Powell BART Station. The store’s web page is HERE. For residents of the USA, it is possible to order petanque boules and petanque equipment (throwing circles, jacks, magnetic boule lifters, etc.) via Decathlon America’s petanque page. Decathlon France’s web page is www.decathlon.fr. Decathlon America’s Facebook page is HERE. Geologic boules offer reasonable quality at a very reasonable price. Decathlon can do this by offering a very limited range of only the most popular patterns, weights, and sizes. Geologic offers three general types of boules: really cheap low-end leisure boules, a “Discovery 300” line of leisure boules, and competition boules. Verdict: Do not buy. Too big for kids and too light-weight for adults. 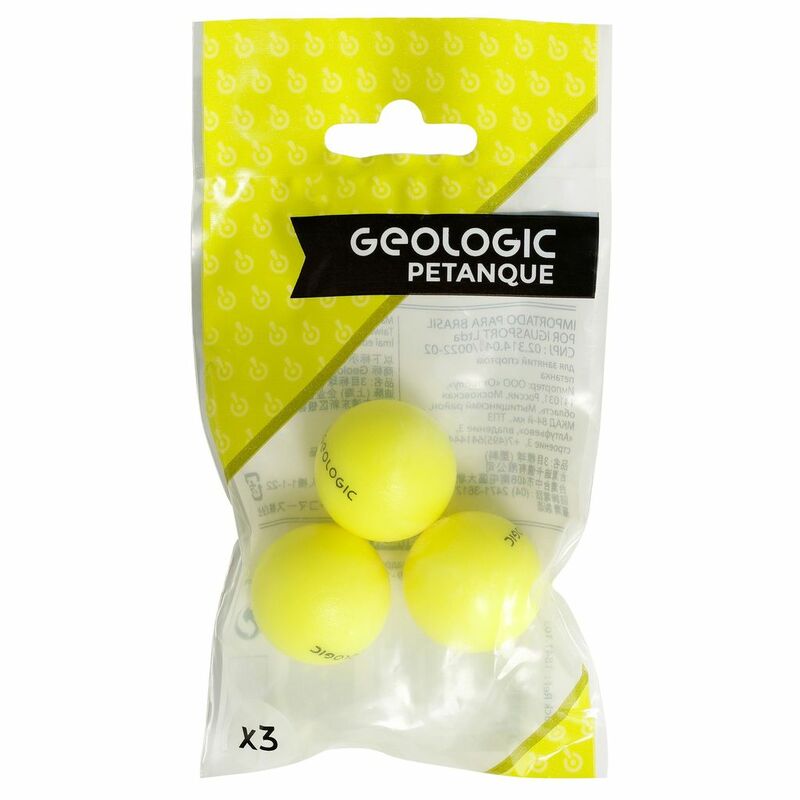 Geologic’s entry-level line of leisure boules seems to me to be seriously misguided. They are 70mm in diameter and weigh 560g. This makes them too light-weight to be acceptable for adult players, and too large for younger kids (junior competition boules are typically 65mm). They can appeal only to people who really don’t know anything about petanque; the same kind of buyers who might buy a set of plastic boules for games on a beach. Like other leisure boules, these boules are filled with sand. 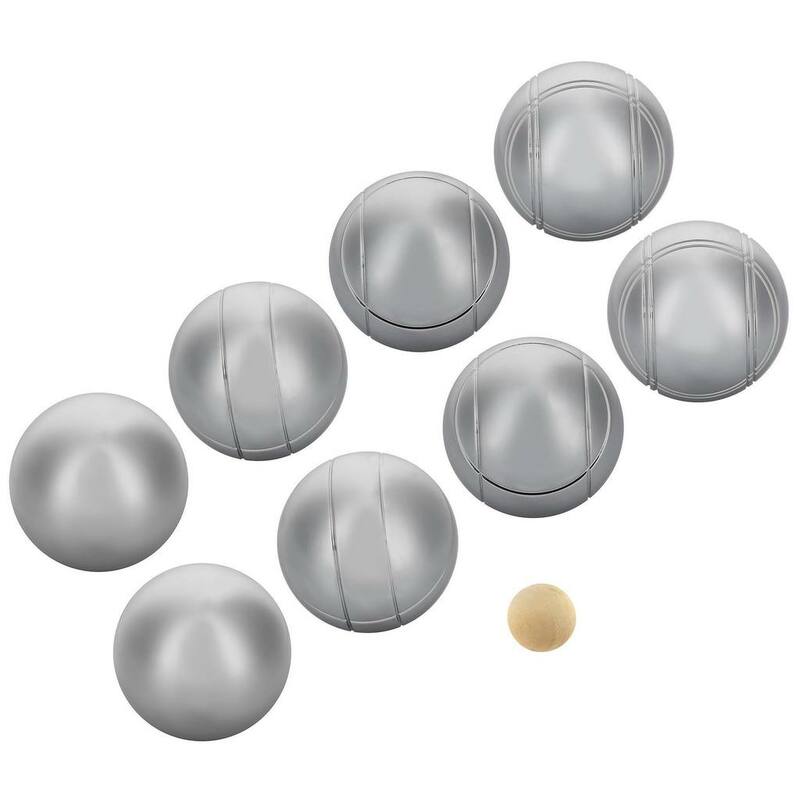 A set of eight boules (4 pairs of 2 boules each; a stupid configuration) costs around $26. Verdict: Cheaper than Obut’s comparable leisure boules, but for $10 more you can get a set of Alpha competition boules. “Discovery 300” is a line of moderately-priced ($41) hollow chrome-plated carbon-steel leisure boules. They are 73mm in diameter and weigh 660g, which is the same size and weight as Obut’s new line of stainless steel leisure boules. They cost twice as much as Chinese-made leisure boules, but less than Obut’s leisure boules. Three designs are available: “baseball”, “classic” (single groove), and “jester”. I can’t speak to their quality or durability. Their price seems to me to be high when you realize that for only a few dollars more you can buy a set of Alpha competition boules. Verdict: Alpha is is an excellent, low-cost choice for your first set of competition boules… if the size and weight is right for you. Geologic offers four models of FIPJP-certified competition boules. They are named after the Greek letters Alpha, Delta, Pi, and Upsilon. The logic behind having four models seems to be to have a line of chromed carbon steel boules (Alpha, Delta) and a line of stainless steel boules (Pi and Upsilon), with a medium-hard and a soft model in each line. Read more about the hardness of boules HERE. The packaging on the set of Alphas that I purchased in September 2018 says they were manufactured in Taiwan. The size as well as the weight are engraved on the boules, like this— “690-72”. The available sizes and weights of the Geologic boules seem to me to be adequate for beginning and moderately-experienced players— advanced players or those with specific size or weight requirements will need to look elsewhere. Prices range from very to somewhat attractive. The real winner in the Geologic lineup is the Alpha, which should be attractive to beginning players looking for a reasonably-priced first set of competition boules. (The Alpha is actually cheaper than Obut’s line of leisure boules.) As of September 2018, the price of the stainless steel Pi line is slightly lower than the price of Obut’s carbon steel MATCH line Petanque America. Will this affect Petanque America? The news of the availability in America of Geologic boules is disturbing. It suggests that we might see in the boules market what we’ve seen in, for example, the books market. A giant chain store moves into a market and drives out small independent vendors by offering a limited set of the most popular items at much lower prices. Customers gain by getting lower prices on the most popular items, but they lose their small local independent vendors, and with them they lose a lot of the options that they once had. Petanque America (and its counterpart in Canada, Marcod) is not something that we want to lose. Petanque America has been a reliable supporter of petanque in the USA for many years, as well as a consistently reliable source of high-quality boules and equipment. Without Petanque America and the Petanque Amelia Island Open, American petanque would be a pale shadow of its present self. Having studied the Geologic lineup, I’m pretty sure that Petanque America will continue to dominate the market for leisure boules. Geologic’s low-end leisure boules are laughable. Discovery 300 leisure boules cost twice as much as Chinese leisure boules and I have no evidence that they are significantly better in any way. This is good news for Petanque America, whose bread-and-butter is leisure boules. When it comes to competition boules, the situation is less clear. Geologic’s advantage is price; its disadvantage is its limited range of options. The Alpha is the cheapest competition boule on the market and we can expect that the Alpha’s reasonable price will make it attractive to beginning players. But the Alpha options are so limited that I think it unlikely that players, as they improve, will buy Alphas as their second set of competition boules. The problem for Petanque America is that the number of American players who own two or more sets of competition boules must be extremely small; it is a real niche market. Even if Petanque America could dominate that market by selling Obut boules, it probably wouldn’t add much to their bottom line. Geologic sells two models of jacks: what they call recreational jacks, and wooden competition jacks. Customer reviews of the recreational jacks on the Decathlon site are virtually all positive, with players praising the jacks’ durability, visibility, and affordability ($3.50 for a pack of 3). The designation recreational jacks is important. These jacks are designed specifically for recreational use (like leisure boules) and are not authorized for use in FIPJP-sanctioned competitions. They are made of solid plastic which is reported to be very durable; paint will chip off of wooden jacks, but that won’t happen with these jacks. They will retain their color for a long time. One of the strong selling points of these jacks is that their bright fluorescent yellow color makes them easy to see in poor lighting conditions, in twilight and at dusk. The jacks are 29mm in diameter, which puts them on the small end of the range of legal sizes (30mm +/- 1mm). They weigh 11g, which puts them on the light end of the range of legal weights (10g-18g). Partly because they are so light, and partly because they are made of plastic, they are very lively; if you hit one of these jacks it is going to fly farther and faster than a wooden jack. My advice to Decathlon would be to make these jacks slightly larger and heavier and get them certified as competition jacks by the FIPJP— I think they’d have a real winner. For more information about the rules governing jacks, including some of the issues surrounding synthetic jacks, see THIS. I have used the Geologic Alpha (72/690/0) boules for the last 9 months or so as my first set of competition boules. I have to say that it really gives you good value for money. My only pet peeve is that the coating is slippery especially if you choose the smooth “lisses” boule and tends to slip if your hands are smallish like mine. The striated versions are much better in this context. Since then, I have moved on to Obut Match IT (71/680/0) with a smaller size and lighter weight to suit my playing style. 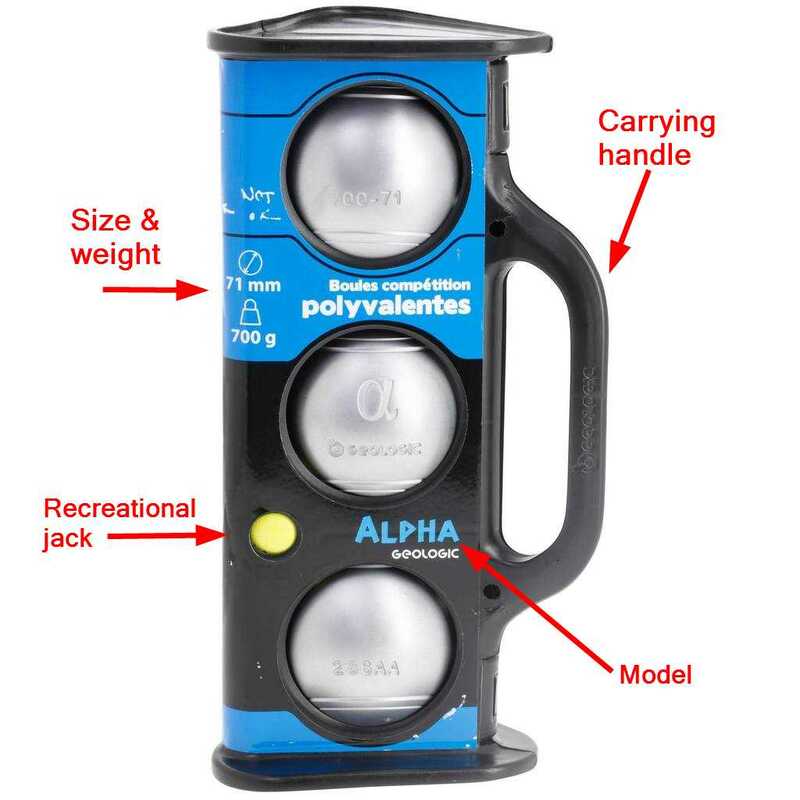 Nevertheless, the Geologic Alpha boules are great for training and you really cannot beat their pricing. It is almost ridiculous !! Note that late last year, I wrote to Decathlon France and they informed me that beginning of this March (2018 season), they will introduce smaller sizes for their Geologic range – for Alpha boules, there will be 70.5 mm and 670 grams boule available. If you have petite hands, you may wish to wait. Decathlon may kill off the undiscerning beginner’s market (large volume) for many independent vendors but it will not be able to enter the higher end range of the market as its offerings are too limited. The key to all this is OBUT’s marketing strategy. If you have read some of the discussions in the reviews of Decathlon France website, you will note that currently Obut is limiting the availability of their boules to only Match and Match IT with limited combinations of size/weight to be sold by Decathlon. So long as Obut continues this position, I do not foresee any visible impact in the higher end boules market except for the La Franc boules. This is what I had experienced when I was looking for competition boules. At the beginning of August 2018 Decathlon announced that it is now shipping to all of the states in the continental USA. Shipping to Hawaii and Alaska is expected to be available soon. Shipping is free on orders over $50, which means that shipping on an order of Alpha boules ($53) should be free. Unfortunately at that time all of the boules in the “Discovery” line of leisure boules, and the Alpha competition boules, were marked as “Sold out”. But a nice feature of the pages for sold-out items is a link that you can click to be notified (by email) when the product is again available. The current Geologic boules (2018 series), based on the videos I have seen on Youtube recently are now made by FBT Thailand, the maker of La Franc boules. You can compare the “identical” properties (HrC) between the new Geologic range and La Franc series i.e. So, in a nutshell, I think we can be pretty confident that we can get the same decent quality boules at affordable prices under different branding. 🙂 The problem is getting them. It seems supply cannot meet the demand. We are still waiting for these boules in Asia, so far, I have only seen them available for sale on French and UK websites. Thanks for this interesting information! The boules that I received in September 2018 (from the San Franciso, USA, Decathlon store) were made in Taiwan. But in this video (starting at 2:12) you can clearly see Geologic PI and DELTA boules being manufactured in the FBT factory in Bangkok, Thailand.